I met Idania about three years ago at the Eleventh Havana Art Biennale in front of Rene Francisco Rodríguez’ project called Ciudad Generosa. I immediately was struck by her extraordinary sensibility for the arts, the lucidity of her views and especially her desire to involve herself in these kinds of activities. We hadn’t seen each other since that time, but have some friends in common and they talked to me a bit about a part of her work. I became convinced that she was one of those artists who created from the gut, going from the most inner part of the individual and surfacing with novel ideas. As I went over her trajectory I learned that she graduated from Graphic Design and Visual Communication from Havana’s Higher Institute of Industrial Design, ISDi for short, in 2004. Then she wound her way through other fields, diverse and controversial ones, such as the Nuevos Fieras painting workshop run by Rocío García at the San Alejandro Academy in 2012, an art direction course at the International School of Cinema and TV (EICTV) at San Antonio de los Baños in 2009 and Piedra, papel o tijera, a design workshop promoted by Isidro Ferrer at the Cultural Center of Spain in 2003. Immersing herself in these areas confirms her fascination for a plurality of languages that she can incorporate into her projects to give them a touch of contemporaneousness. In order to understand her art, all we have to do is look at the posters she has been creating recently. They provide us with the ideal entry into her world. These posters carry a heavy dose of subjectivity, giving viewers the chance to reach a variety of interpretations and in this way participate in her work—it is a dialogue with a multitude of symbols. These posters have given Idania her current recognition level in the circuits of Cuban design. She has concentrated on the theater and music being made in Cuba today. In both cases, she has chosen to deal with alternative projects, or maybe it is those projects that have chosen her because they know she is top-notch. The theater of Rogelio Orizondo, one of Cuba’s most talented and audacious young directors and playwrights, has become one of her most striking subjects. Given her visible capacity of approaching several topics, her posters also deal with the cinema, promotional campaigns for the defense of gender rights, and art events. But there is also an entire body of work where she divorces herself from the task of promotion and lets the posters speak for themselves. Here, she usually makes use of parody, of a subtly ironic language that explores areas concerning popular speech. In my opinion, her posters become inserted in a graphic art with notable political connotation and social impact. It is important to comment on the fact that Idania del RÍo has reached this position thanks to her intellectual consistency and theoretical training. In this context, she has lectured both in Cuba and abroad: “Invisible Lines”at Cubanica Studio in New York, 2014; “Mi historia esa,” at the Tether inc. offices in Seattle in 2014; and “Cuba Gráfica” together with some other Cuban designers at an event at the École d’Art Maryse Eloy / Gobelins, L´Ecole de l´Image, Paris, 2012. Her talent and productivity have now been inserted into a location that we are able to visit on calle Villegas No. 403, a stone’s throw away from Plaza del Cristo, in Havana’s Historical Center. Idania del Río has created a design shop and called it Clandestina. It has granted tangible physical presence to her vision of design and to the role it should be playing in society, incorporating as many designers as possible. Specialist in cultural management and creative industries, Leire Fernández, accompanies her in this adventure as production manager of Clandestina. Initiatives of this sort are projects with creative processes having remarkable esthetic and conceptual merit. They are enterprises that will surely breathe life into a jaded commercial scenario generally only responding to necessity. After wandering aroundClandestinafor a while and taking in the clothing and other objects available, I understood the spirit of the place. It is an invitation for reflection, providing good taste and unique designs in a positive and somewhat whimsical vein and at the same time functions as a factory-workshop for the products being offered. 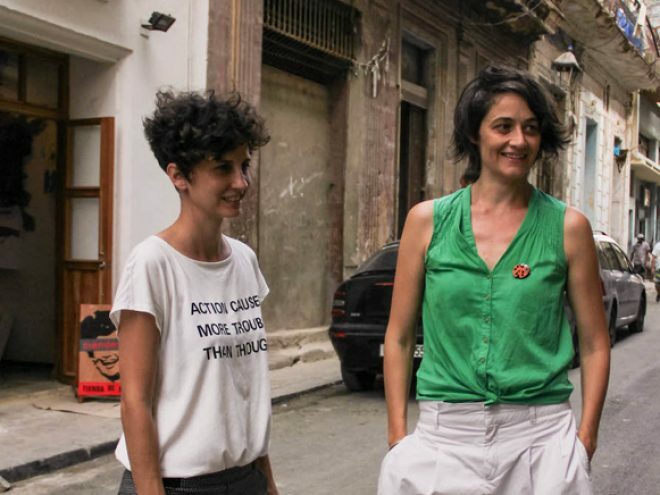 Clandestina is going to be an active participant in the 12th Havana Art Biennale, decorating the balconies of this section of Villegas Street with clothing recovered and revitalized by the Vintrashe project, one of the most attractive initiatives of the shop. This is an exclusive collection inspired by the daily activity Cubans have of coming up with solutions, “resolviendo” as they say. These are reinvented objects and clothing, taking on new use values. For example, everyone can bring a discarded T-shirt and it will be redesigned and given back to the original owner. This will be done together with Fabrica de Arte.